soft and fuzzy mittens made from lambswool and angora sweaters that i've been collecting from thrift shops for the past few weeks. may everone who got a pair enjoy toasty warm fingers on chilly winter mornings! 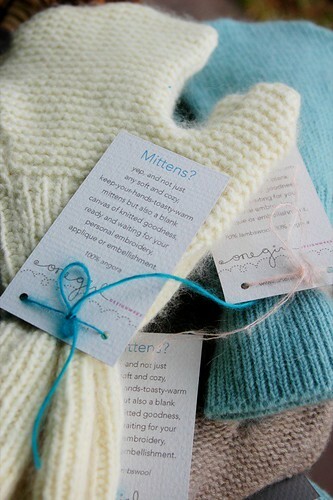 there are more mitten photos on my flickr site for anyone who is interested. tomorrow i'll show my loot and tell a little bit about each of the fabulous ladies involved. Thankyou for coming. It was great to finally meet you after reading your blog and admiring you work for so long. I LOVE my mittens, i want it to be colder so i can wear them! Oh what fun!! those mitties are sooo soft looking!! So lovely to meet you Leslie, and thanks so much for the beautiful Mittens and card. they will be put to good use!! I love love love my mittens, the colour is beautiful, now I just need some cold weather to show them off.